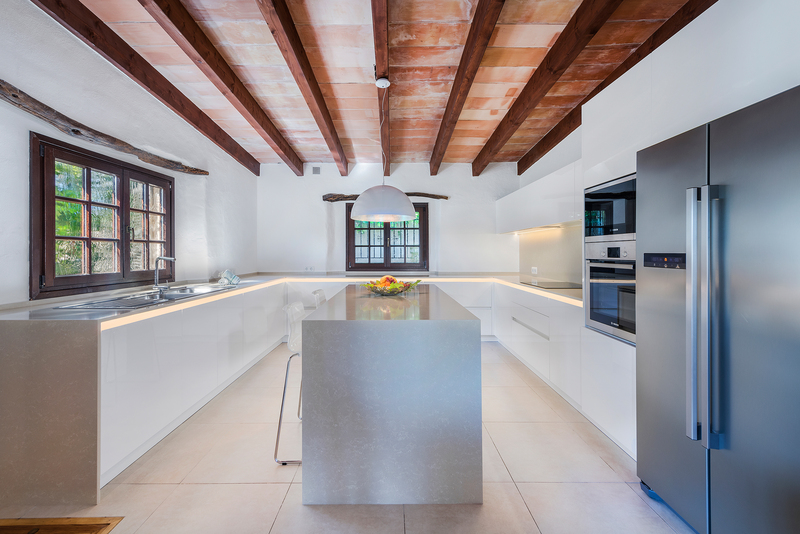 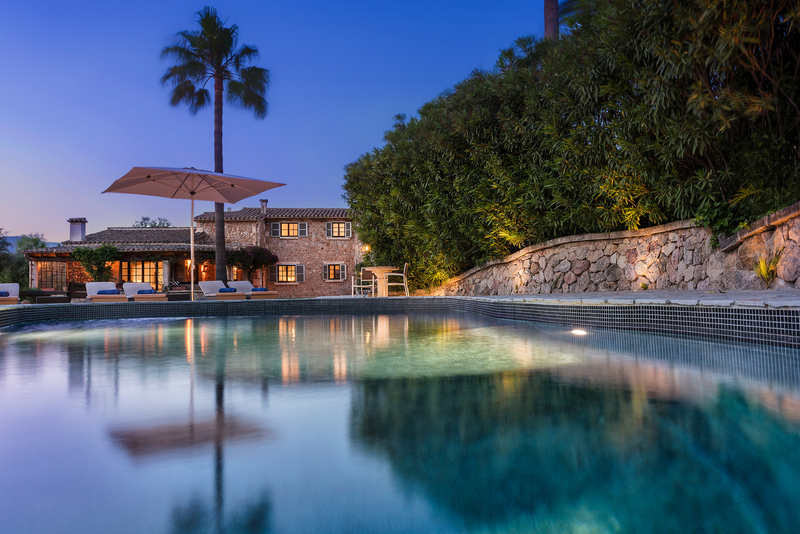 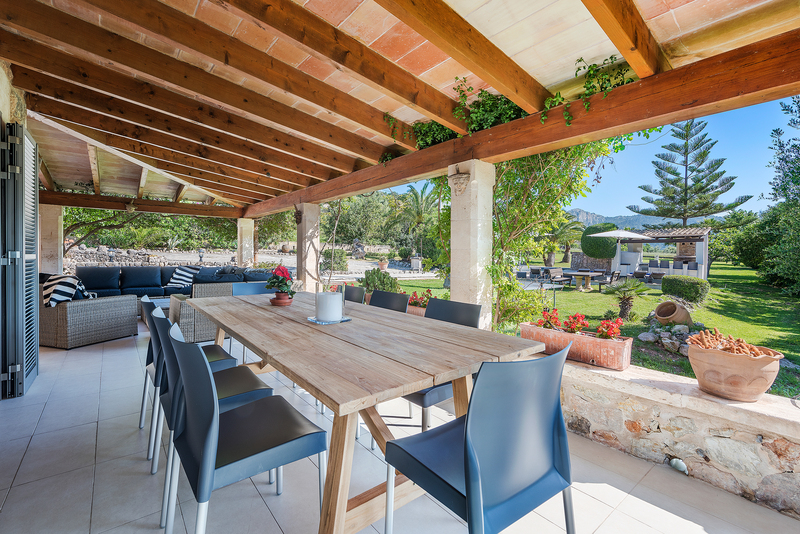 There is something special, something timeless about a Mallorcan country estate. 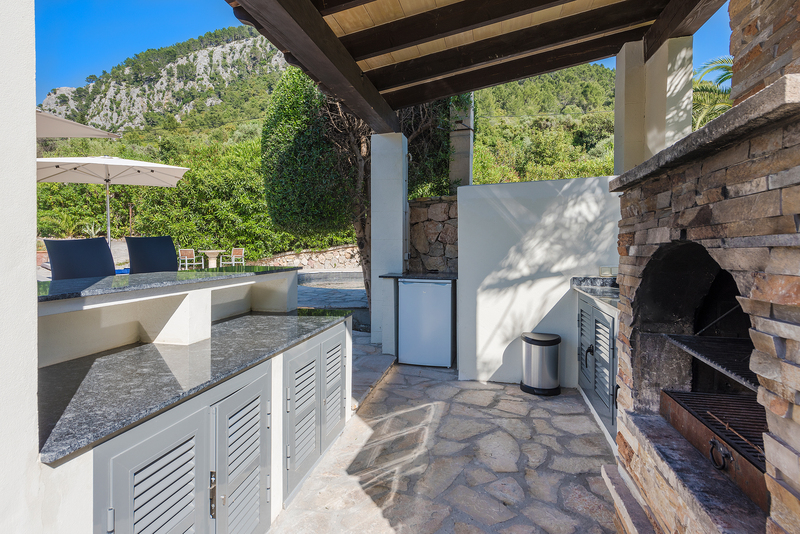 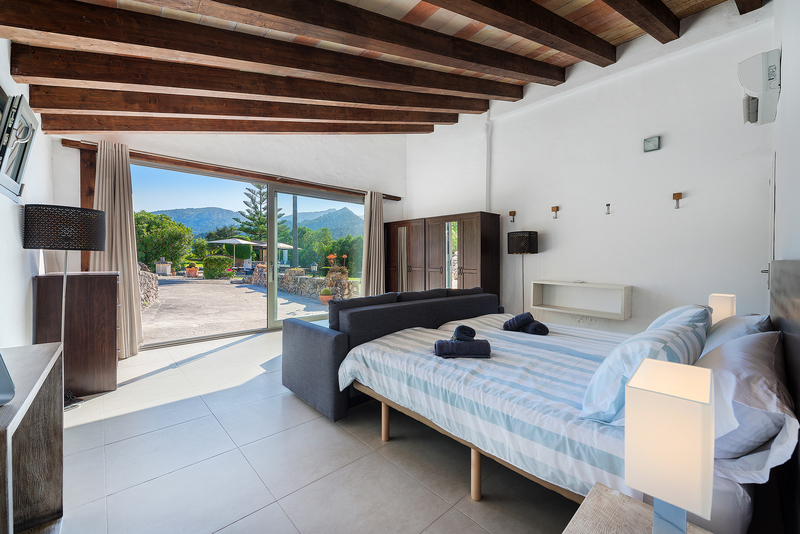 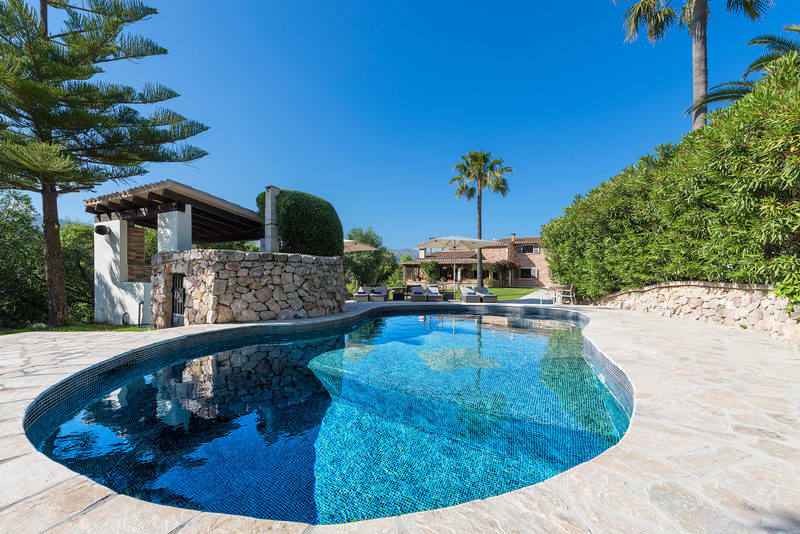 And a perfect example of this is the beautiful Villa Can Coste situated in the north Mallorcan countryside near the ancient town of Pollensa. 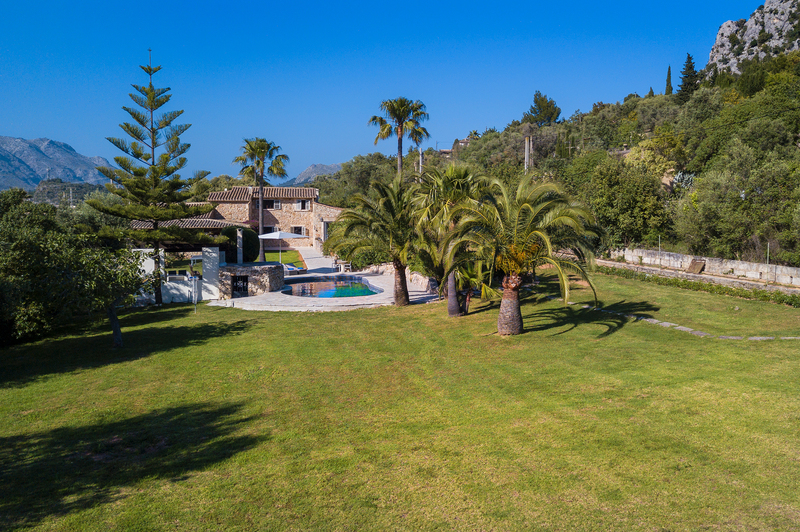 It may as well be called Puig Gardens, as you will certainly not find gardens as vast as these elsewhere at the foot of the Puig and facing Pollensa! 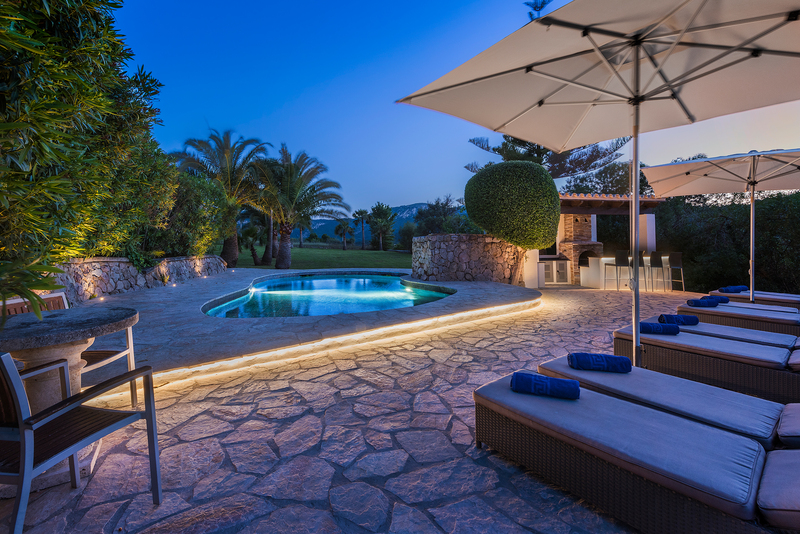 After undergoing an extensive renovation, Can Coste provides an idyllic place in which to escape from the pressures of the modern world and relax in a timeless Mediterranean setting. 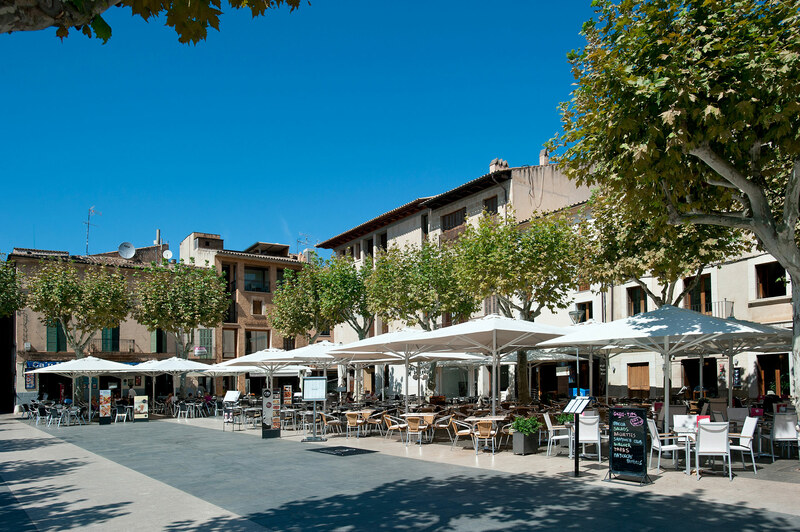 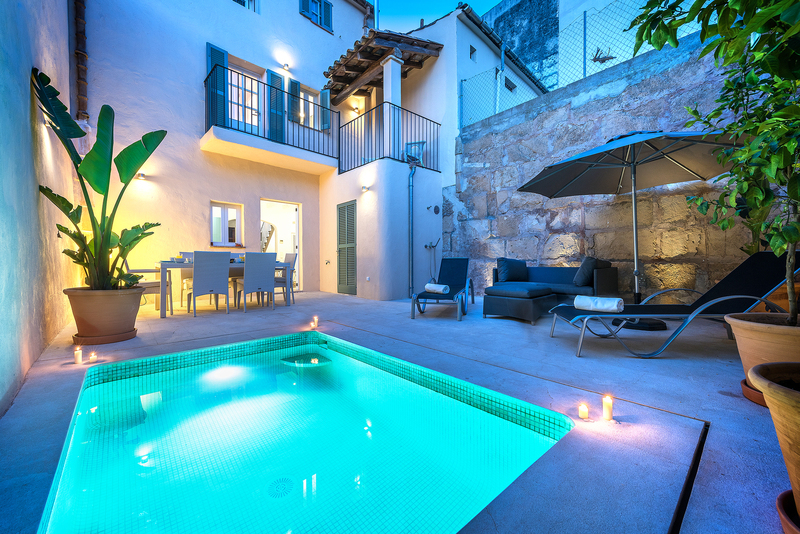 Villa Can Coste combines the best of the old and new. 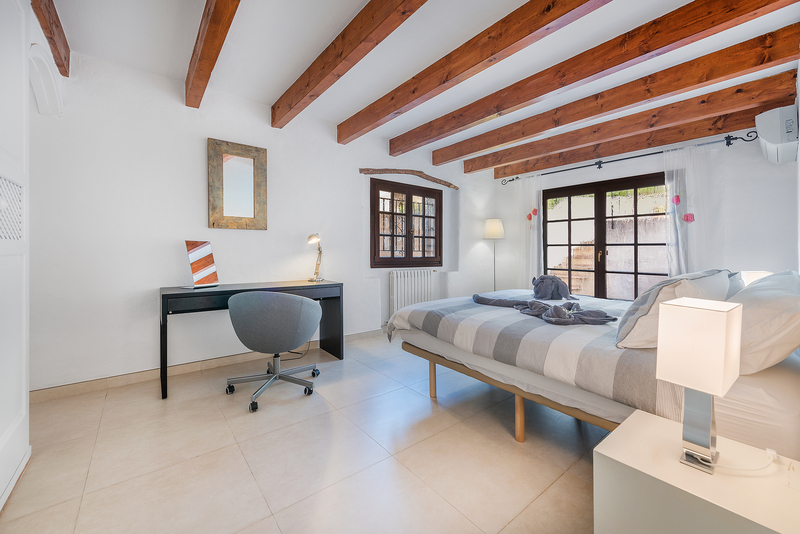 Local stone, terracotta roofs, stone archways and solid wooden beams give you a glimpse of a rustic past, whilst all the modern comforts you would expect are catered for to make your holiday one to remember. 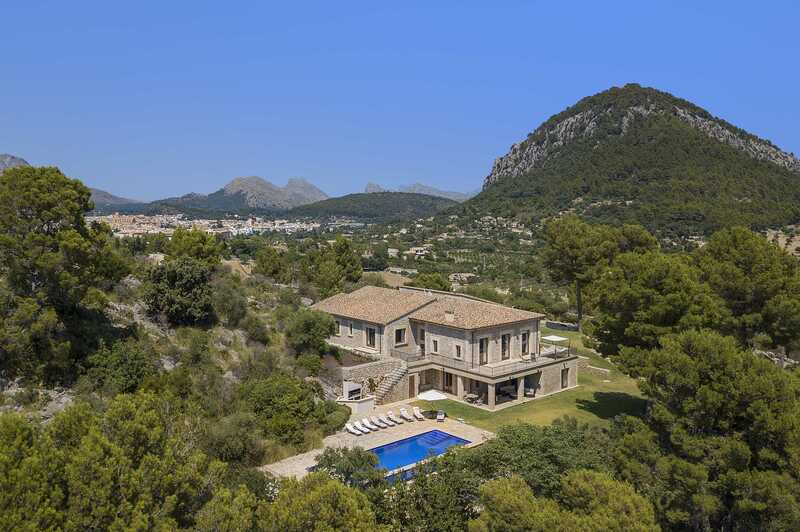 As you approach Villa Can Coste one is immediately impressed by the location. 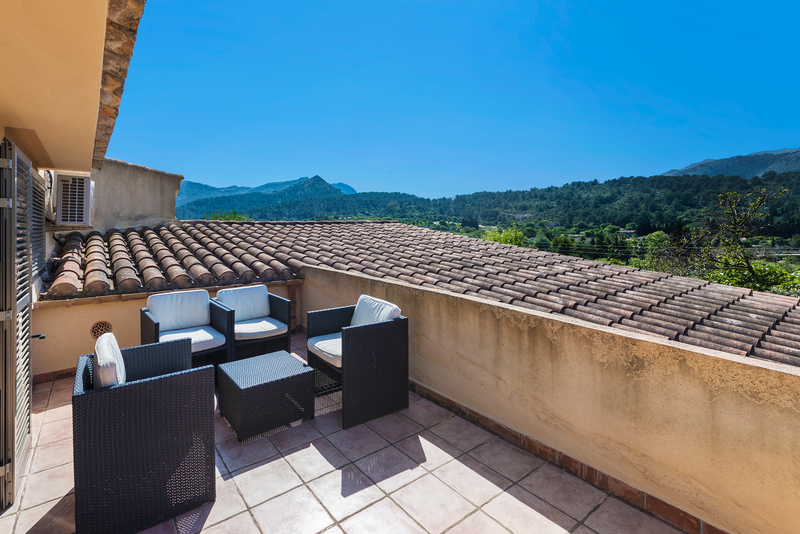 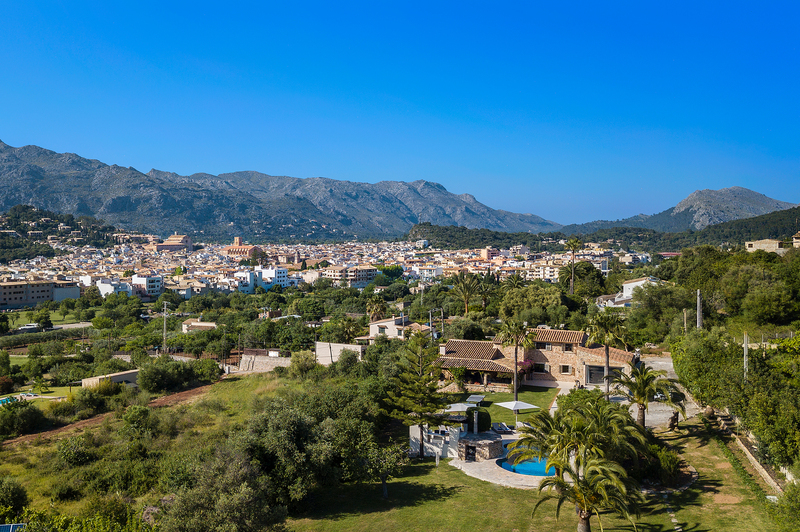 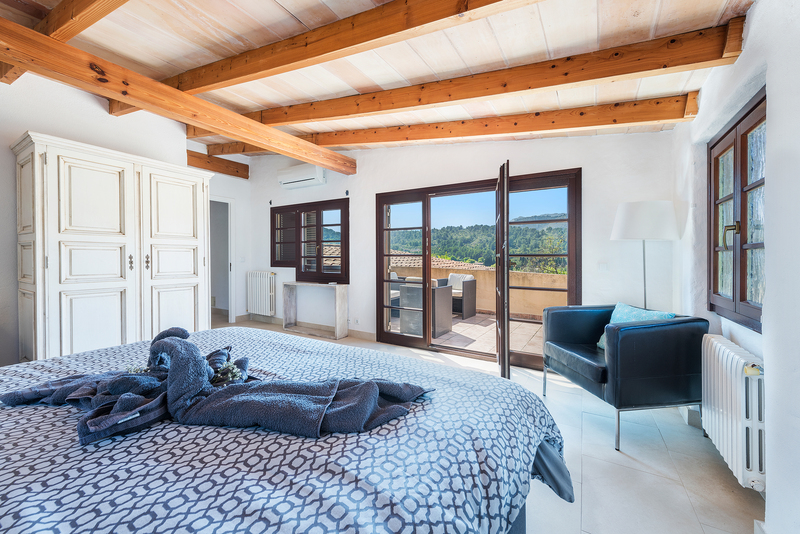 Nestling snugly on the hillside of Puig de Maria, the views overlooking the Tramuntana mountains are delightful. 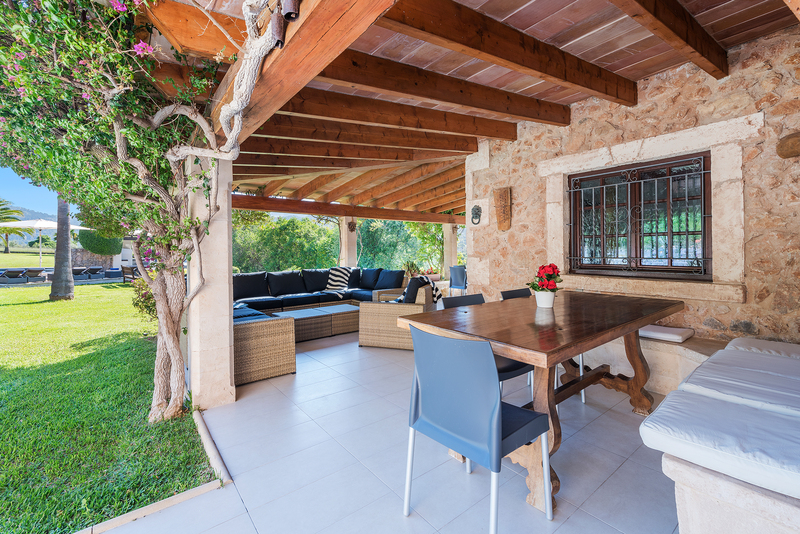 An array of pretty flowers welcomes you to your holiday villa, their petals covering the traditional stone façade in a riot of colour. 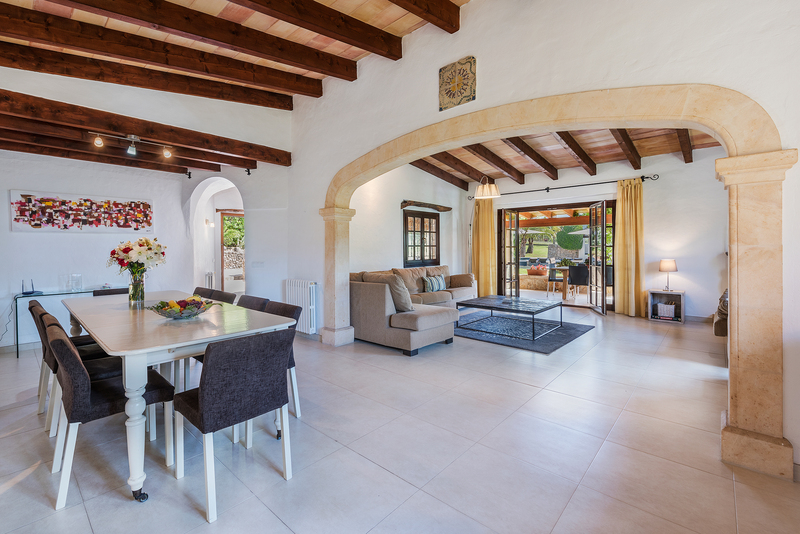 The large spacious living room at Can Coste is ever so stylish. 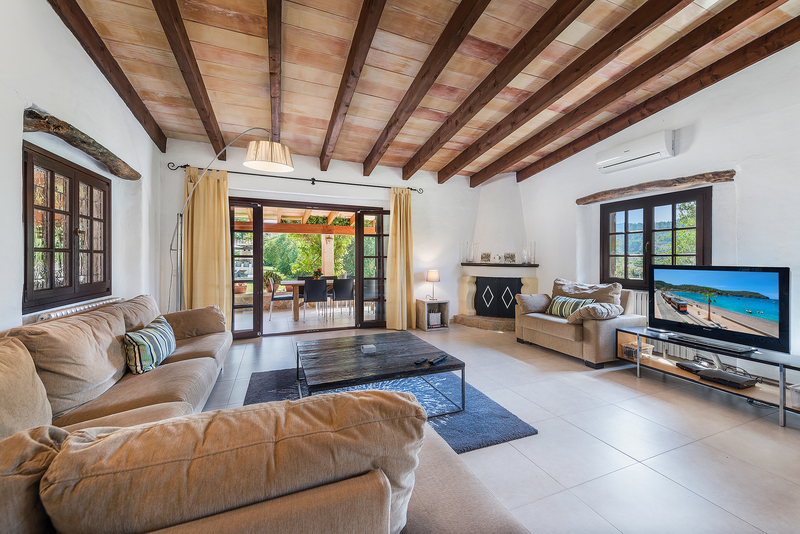 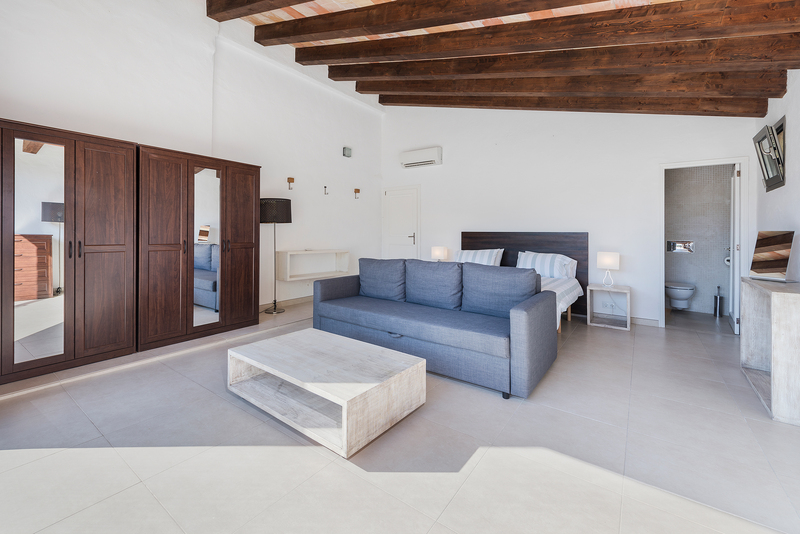 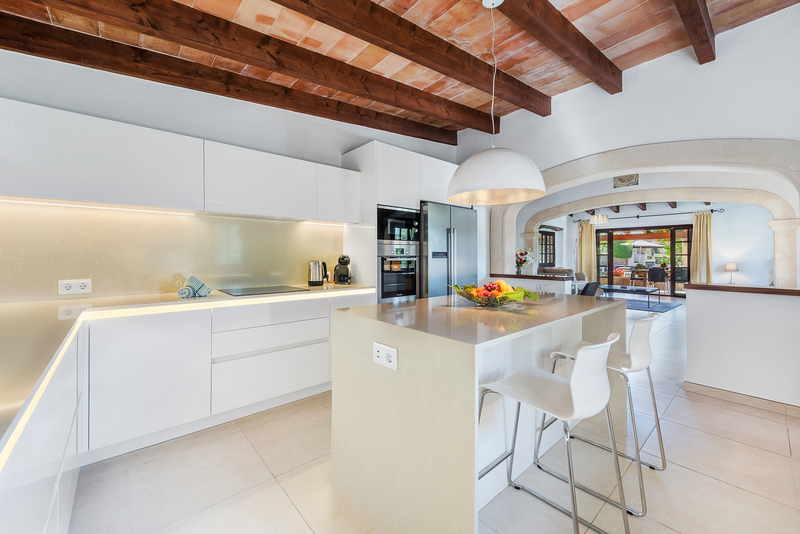 Impressive solid-wood roof beams, terracotta tiled floor, traditional stone fireplace, large windows letting in the soft Mediterranean light – all complimented by chic contemporary furniture, cosy sofas and a large satellite TV. 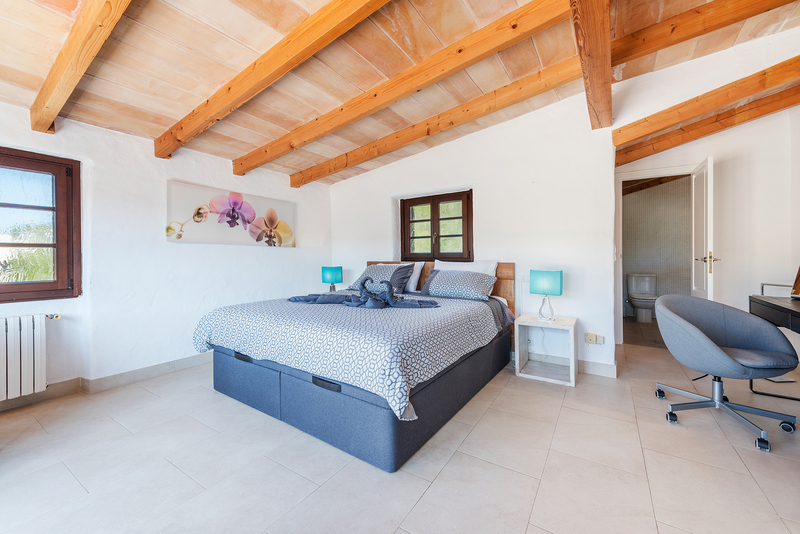 There are five spacious bedrooms in Can Coste, sleeping up to 10 guests in effortless comfort; in the main house there is a double and a twin bedroom on each of the two floors, and a fifth, twin, bedroom in an annex with it`s own independent entrance - this room also has a sofa bed which can sleep another 2 guests. 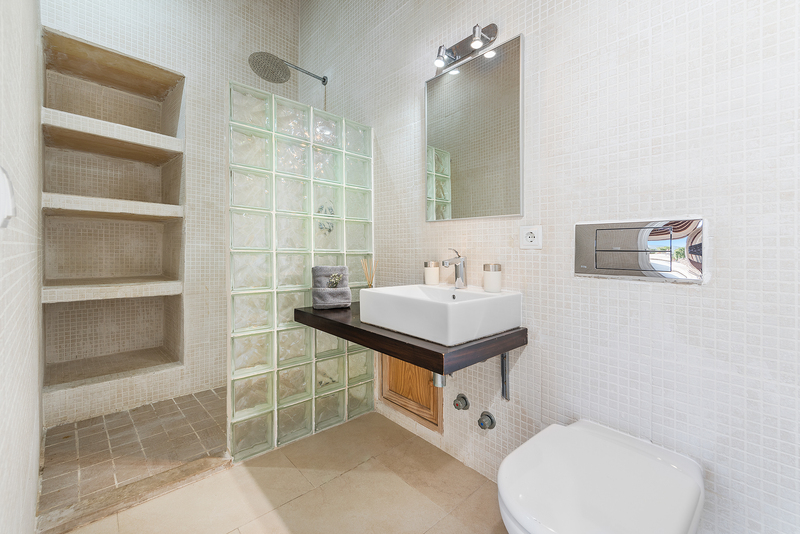 All bedrooms are en suite. 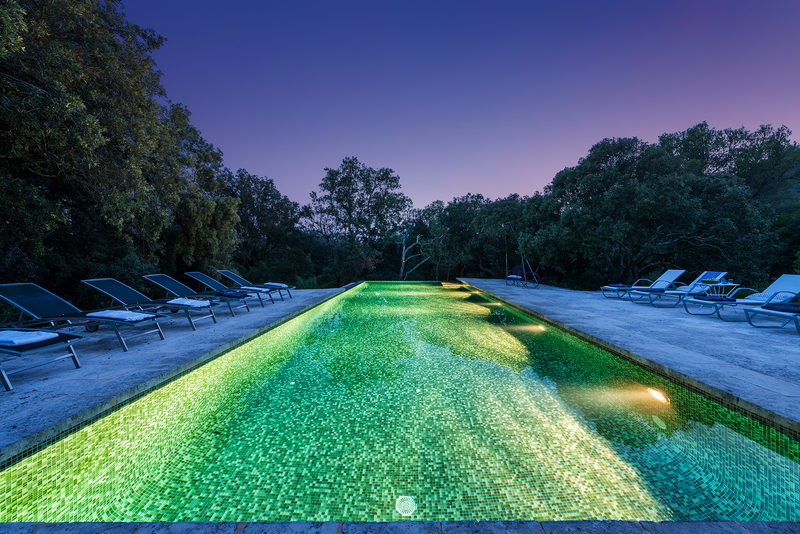 The exterior of this fabulous property is a delight. 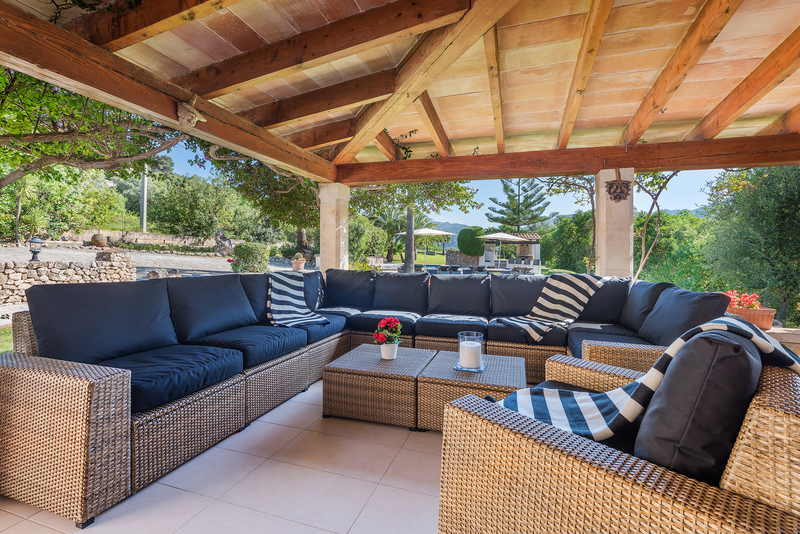 You’ll enjoy both sunny and shaded outdoor terraces – perfect for an al fresco breakfast, or simply to watch the sun go down in the evening, gin and tonic in hand. 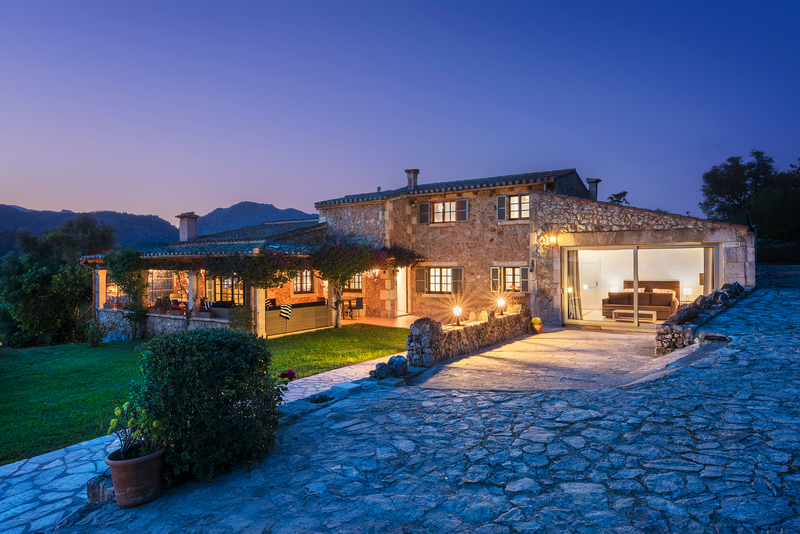 Can Coste is a unique country home converted into a 5-bedroom villa within walking distance to the centre of Pollensa old town. 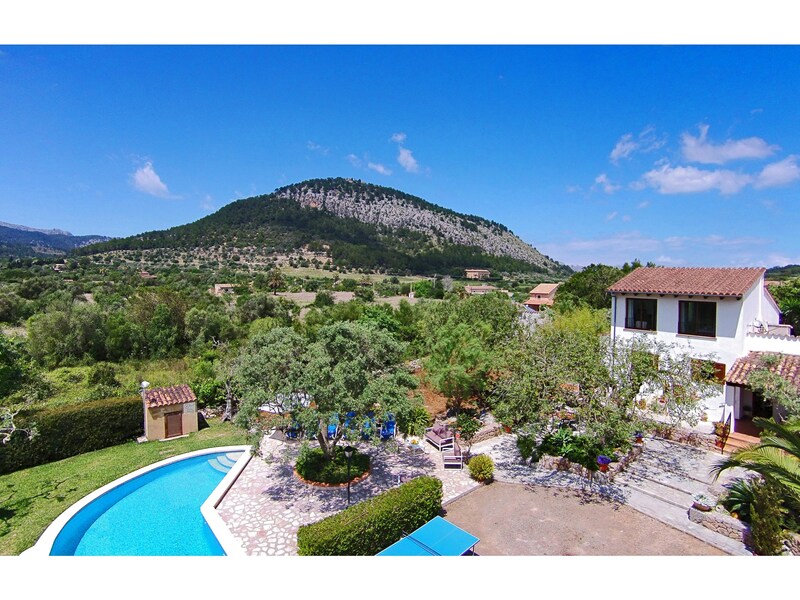 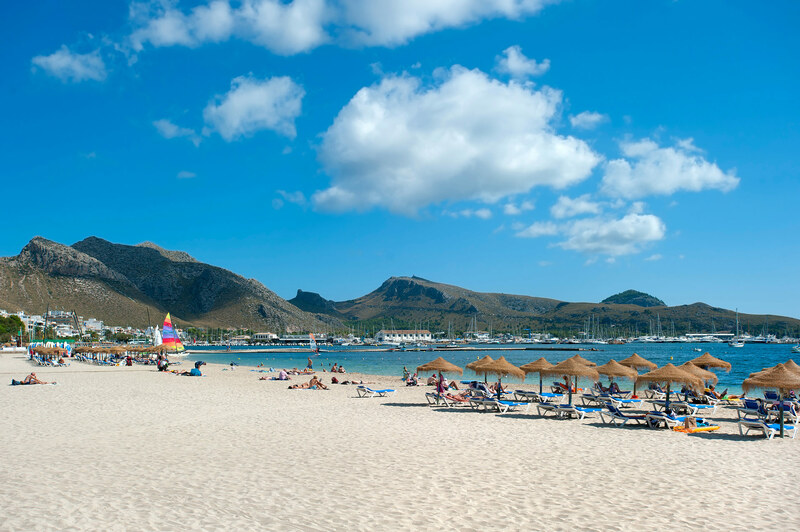 It really is a fabulous rental property and early booking is most recommended. 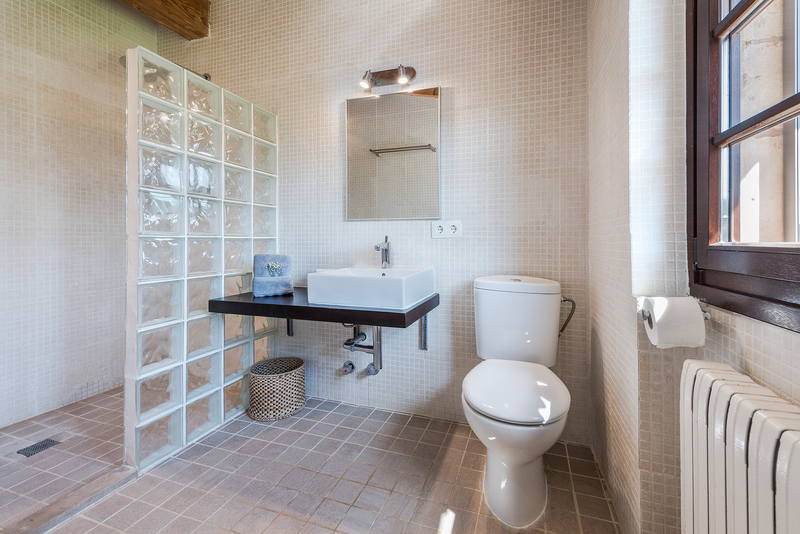 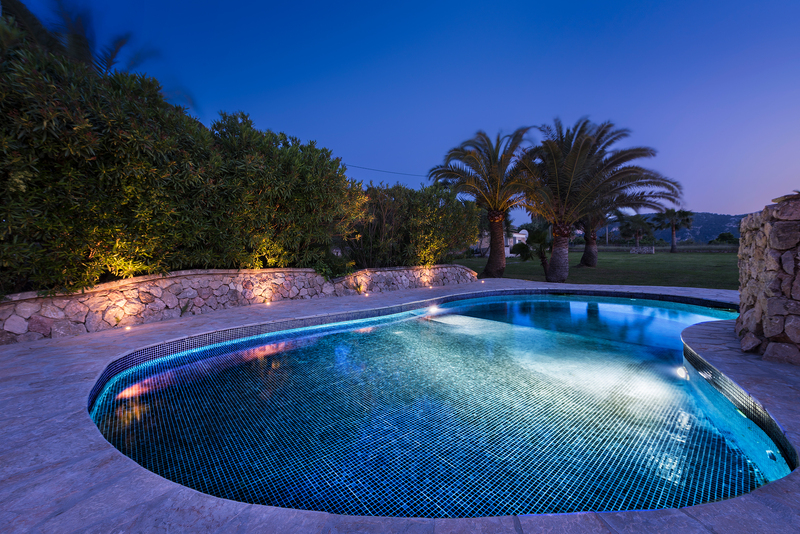 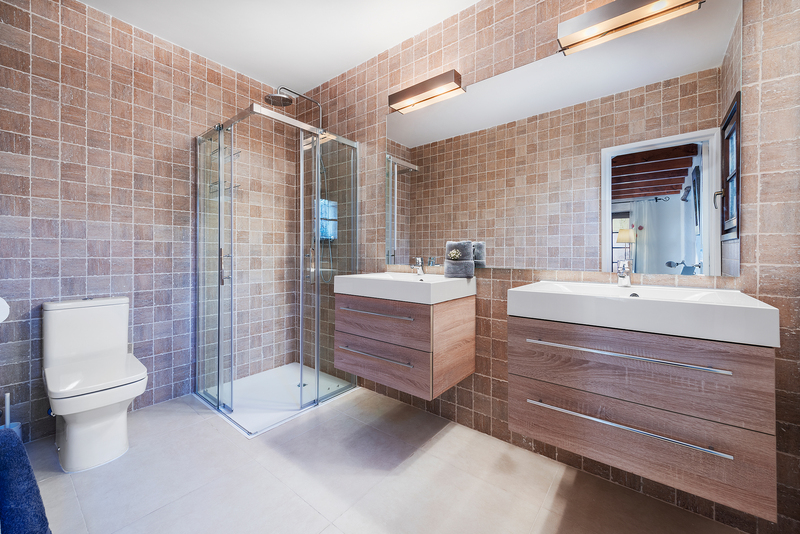 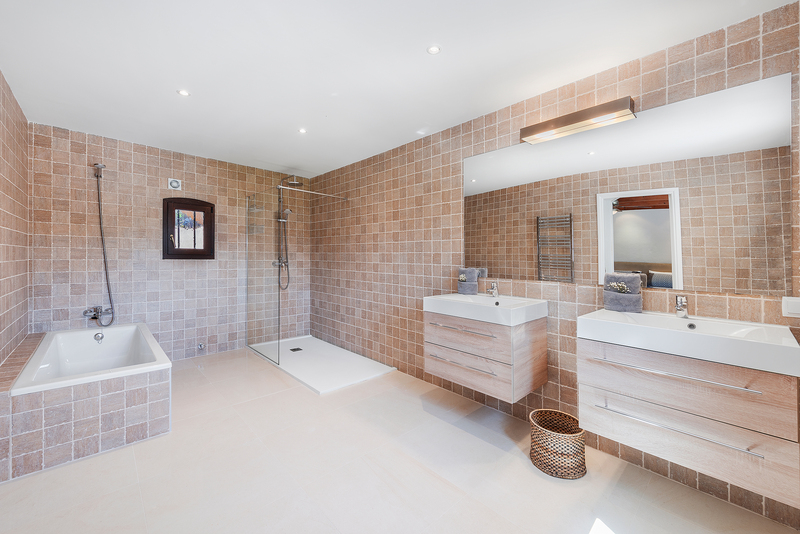 - pool heating: if available at the desired property, please contact us for further.